Eggland's Best 100% Liquid Egg Whites are made exclusively from farm-fresh Eggland's Best shell eggs that come from hens fed an all-vegetarian diet of healthy grains. Our feed contains no added hormones, antibiotics or steroids, and no animal by-products, recycled, or processed foods. 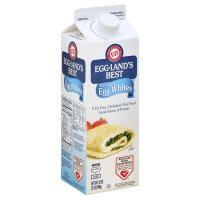 So, when it comes to our liquid egg white nutrition, you can be sure it's as good as our shelled eggs. You must click on this offer to get the printed coupon.